Highlights from this volume begins with the arrival of the revived Erza and Gray, thanks to Gajeel. Erza battles her Edo-self while Happy leaves to take Gajeel to where the rest of Fairy Tail are. 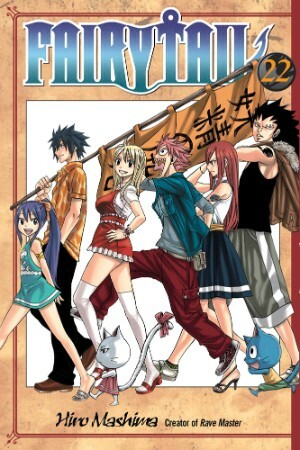 Gray, Natsu, and Carla go to rescue Natsu and Wendy, giving them pills from Mystogain so they can use their powers again. They have to battle some of Edo’s captains while in the capital, King Faust is betrayed by one of his young aids, Coco, who steals the key to the weapon that will rid Edolas of the Exceed as well as restore magic to the people of Edolas. Faust injures her, but she escapes, pursued by Byro until she runs into Lucy and can run no more. Lucy battles Byro, who’s defeated when Natsu comes busting through a wall. Sugarboy steals the key, leading to a confrontation with Gray, whereupon Gray ends up destroying the key, retaining the ability to make a copy with his ice. Wendy and Carla try to warn the Exceed of the danger they are in after the Edolas forces defeated the Exceed forces, but no one believes them and they are stoned for their efforts. Gajeel battles Lilly, the Exceed cat who’s working for Edolas, in order to force Lilly to become his cat. Erza disguises herself as Edo-Erza to pretend to take in Natsu and Gray as prisoners. However, the real Edo-Erza manages to return in time to thwart their plans. Coco comes in on her Legion beast to rescue the Earthland heroes. Mashima-sensei’s cosplay fetish with Lucy aside, her fight with Byro was actually her best one yet in some ways. I say this because she was quick witted, and her use of Virgo, who was such an awesome badarse for her brief cameo, was a nice touch. Gajeel’s battle with Lilly made me laugh when Gajeel promised to make the cat his own. I figure that will happen since I already know there’s a black cat (or the regular Exceed size) with Gajeel now. Mystogain is name-dropped and is the one providing Gajeel the knowledge to free Fairy Tail members and unseal their magic. This element of the story is kinda pushing it for me, but not heavily. On the Kodansha side of things, the usual honorifics are…I don’t know. I do know this part of the story had less honorific usage, but I do know of at least one instance where “Erza-sama” was reduced to “Erza”. Also, the usual two pages stating Kodansha’s commitment to Japanese honorifics and their definitions is missing. Also missing are any translator notes. Now, it may be that there was no need, or maybe there was a lack of free pages. There are extras though, including some art, Mysteries of Fairy Tail, and an afterward by Mashima-sensei. Overall, there’s lots of fun action, some fanservice, and some comedy to boot. This volume was certainly an improvement for me over the previous one. You didn’t mention it so I don’t know if you are aware but the spear that Edo-Erza uses has the same name and abilities as the sword used by Haru, the main character of Rave Master. Rave Master is an entertaining series, Plue is also from there originally and there are lots of references to it throughout Fairy Tail. There is a Fairy Tail/Rave Master crossover that is also quite amusing. Now that you mention it, I believe I read a Fairy Tail/Rave Master crossover chapter. Natsu and Lucy were in it, if I recall correctly.